Mission Statement: As a community of believers saved by God's grace, we live faithfully by loving and forgiving our neighbors, helping them to know God's promise and share in God's gifts. 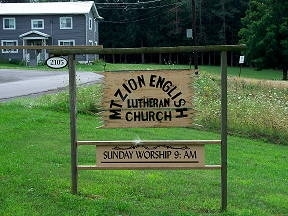 Mount Zion is a small, rural congregation located on Airport Rd. near the Punxsutawney Airport (see Map & Directions for details). We work with First English Lutheran to provide Christian education to children, youth, and adult members of our congregation. We feel called to help our neighbors in need both locally and internationally. We support Heifer International, ELCA World Hunger Appeal, Woodland Avenue Food Pantry, a missionary to Uganda, and many others. Currently, our weekly Liturgy of Holy Communion is at 11:00 AM on Sunday mornings. We have special services for the Wednesdays during Advent and Lent, Christmas Eve, and Ascension. We also have an Easter Sunrise Service followed by a fellowship breakfast.